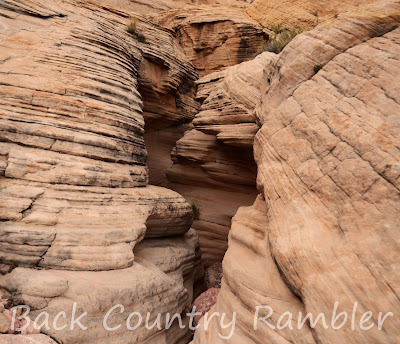 The cultural landscape of the Whitney Pockets area is as rich and colorful as the sandstones that break from the desert floor at the landing of Virgin Mountains. 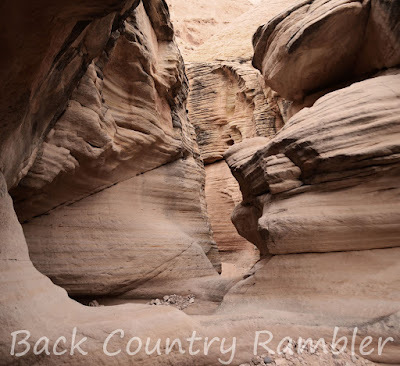 It is within these sandstone outcroppings where some of the first known inhabitants recorded their story in rock carvings known as petroglyphs. 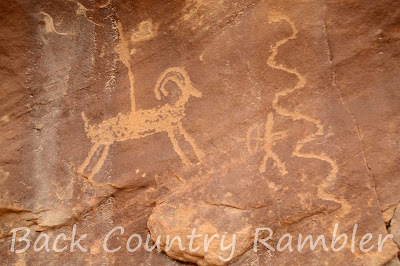 The Luke Whitney Petroglyphs which include Falling Man are some of the most accessible petroglyphs in the Gold Butte region. 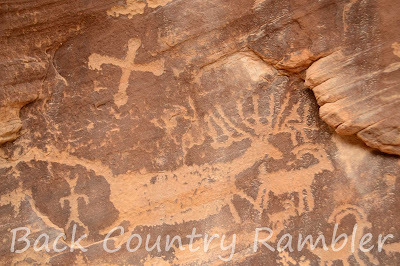 Just a short distance off the old Gold Butte Road, down a rough and rocky road one can be surrounded by the carvings etched upon the red sandstone canvas. For the back country rambler who is willing to lace up their boots and wade farther back into the sea of sandstone, there holds even more portrayals from prehistoric people. Hidden within an arroyo at the head of Hartman Tank is the petroglyph site known as Kohta Circus is. 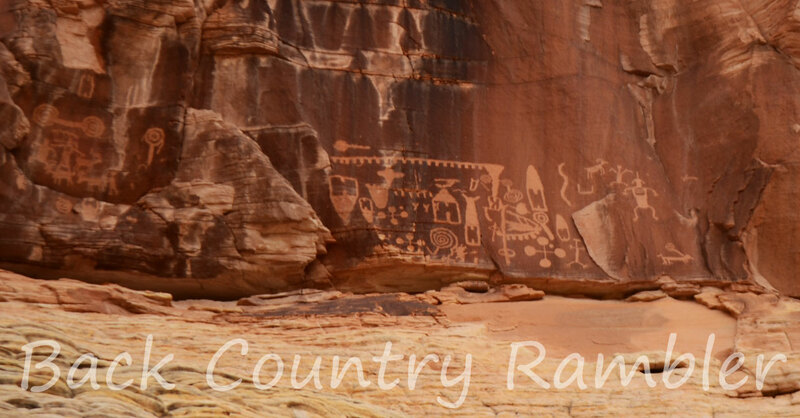 To find the Kohta Circus Petroglyphs first go to the Luke Whitney Petroglyphs also known as Falling Man. Once you get to the trailhead of Falling Man you will see a road that heads to the west continuing on down towards Black Butte and Bitter Ridge. You continue on down this road for about two miles. This road is not maintained in any fashion however most high clearance vehicles, with an experienced driver at the wheel, should be able to pass without the need for four-wheel drive. As you start to head more south and start to round Black Butte you will see a trailhead off the east side of the road as the road starts to climb up out of the wash and onto Bitter Ridge. The trailhead is for the Kohta Circus Petroglyphs hike. Once you get to the trailhead it’s hiking from here on out. Leaving the trailhead you will get into the nearby wash and head in a southerly and slight easterly direction. The trail at this point is quite defined. You are only in the wash for about a quarter of a mile or so. Once out of the wash the trail heads in a steady southern course for approximately 1.5 miles. 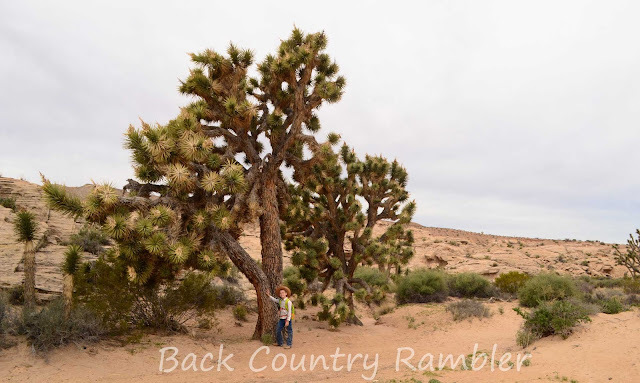 The trail is pretty well defined and is fairly easy to follow for the experienced back country rambler. The only place where it is hard to follow is when the trail crosses over the sandstone outcroppings but at these locations previous hikers have stacked cairns to mark the trail. 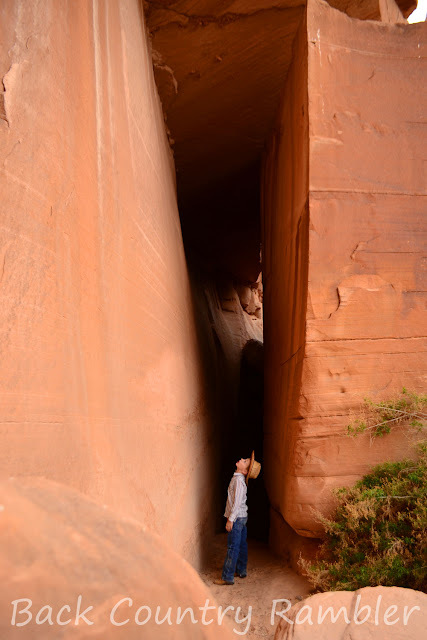 The trail to Kohta Circus Petroglyphs is a mixture of walking in the rocky wash bottoms, patches of sand as well as crossing sandstone outcroppings. Once you get near the Kohta Circus Petroglyphs site you will dump off the plateau into a drainage basin that is the beginning of the Hartman Tank which eventually dumps into Mud Wash. There is a defined trail leading down into the basin area. The main petroglyph panel is one of the larger continuous panels that I have seen in Clark County, Nevada. I have heard that they call it the Circus panel because of all the depictions of animals. There are carvings of sheep, deer, turtles and many kinds of tracks and things I could only guess at. One of my favorite etchings is of a man hunting a sheep with his bow as well as a pretty healthy looking deer. I love the desert as it requires one to appreciate the innate power of nature that has shaped this rugged landscape. As I start down a simple sandy wash and walk down a growing chasm carved into the desert floor, countless centuries of work unfold before my eyes. The rising walls about me stand as evidence of the epic floods that have carved their story into hills and valleys. One cannot help but to marvel at the smooth pathways worn into the stone on a typically dry desert day and help but to imagine the individual drops of each storm that has passed to weary these rocks into submission. Within these desert canyon walls time eludes all logic. The few small slot canyons found within the vicinity of the Kohta Circus petroglyphs aren’t huge but are a great complement to the back country ramble. The chance to be immersed in the churn of colors unearthed within Mother Nature palate is well worth the effort. One thing to keep in mind when visiting Kohta Circus Petroglyphs or any back country destinations within the Gold Butte region is the time of the year to visit. The temperatures in the desert here regularly climb over 100 degrees F. in the months of June through September. The Kohta Circus Petroglyphs are found within a drainage system so if it has been raining or is raining it would be a good idea to get to higher ground. Also the wash that you walk down and cross under Black Butte drains a lot of country so make sure you are able to get back to camp before the water starts flowing down that wash. Don’t cross the wash is there is water running down. A quick thunder burst in the desert can drop a lot of water in a short period of time and you don’t want to get caught in it. Wait for the water to subside before crossing any wash. When visiting areas of cultural significance please pay extra attention to ensuring this area is well-looked-after. It is up to each of us as individuals to ensure these areas a cleaned up and unharmed. Please don’t write on the rocks anywhere near any petroglyph sites.